XI international forum " Intellectual property-XXI century» // Representative Power–Century 21. 2018. 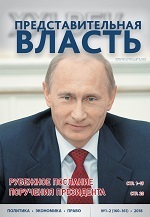 – № 3, pp. 27. 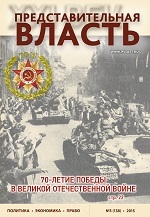 Other important topics include articles by the following authors: Damaskin O.V., Kholikov I.V. 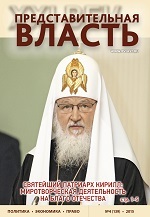 Current problems of protection of the Russian state system and national sovereignty in modern conditions; Yakubenko K.Y. 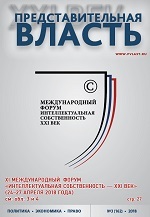 Negative trends in the legal conscience of subjects of law making: the oretical and practical problems (to the 25th anniversary of the Constitution of the Russian Federation); Arefiev N., Mozhaev E. Alternative energy and the economy "a soap bubble»; Yashkova T., Pletneva M. The effectiveness of elections in modern Russian society; Alexandrova N.A., Simahkova N.N. Social management and quality of life to the question of assessing the effectiveness of the state in the social sphere. 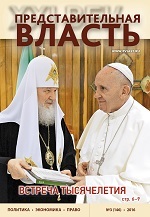 Several other articles also deserve mentioning: Balyhin A.G. Comparative historical analysis and problems of implementation of mechanisms for assessing the activities of local governments; Amiantov A.A., Maslianyi A.A. The organization of activities of the regional parliaments of the Russian Federation; Salimov D.M. 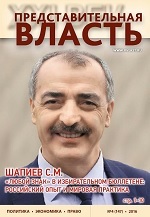 The political significance of modern Tajik media. Platonov Vladimir M. - is the Head of the Department of Political Analysis and Government, Faculty of Humanitarian and Social Sciences, RUDN University, Candidate of Legal Sciences. Abstract. 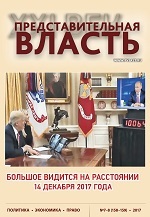 In the present article objects of exclusive competence of territorial subjects of the Russian Federation through a prism of their role in ensuring balance between the federal and regional authority are considered. 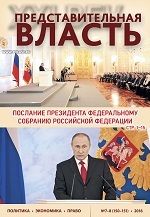 The author makes a conclusion that the Russian Constitution, on the one hand, fixing objects of exclusive competence of territorial subjects of the Russian Federation of the residual principle, recognizes rather a wide volume of competence; however, on the other hand, at realization of this competence territorial subjects of the Russian Federation are seriously limited both by bases of the constitutional system of Russia, and specific powers of the federal authority which allow to interpret broadly objects of mutual competence of the Federation and its subjects, thereby narrowing the volume of the rights of territorial subjects of the Russian Federation in questions of their exclusive competence. Thus, exact definition of objects of exclusive competence and powers of territorial subjects of the Russian Federation is in direct dependence on a position of the federal authority. Key words. State, law, legal culture, objects of exclusive competence, differentiation of competence, territorial subject of the federation, bases of the constitutional system. Notes about the subscription. 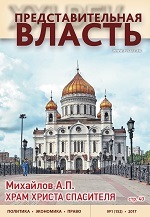 The electronic form of this article you can find in the Scientific Electronic Library "eLIBRARY.RU". SEL is the largest Russian information portal in the field of science. Full print version of this article you could find in the journal. 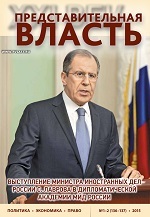 Also you can order additional paid copies of this journal via the editorial office or subscription Agency. Примечания о подписке. Полную версию статьи или весь номер, а также любые номера и годовые подписки в эл. виде можно приобрести на следующих электронных ресурсах. 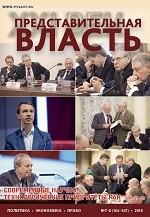 Oleg V. Damaskin – Doctor of Law, Professor, Honoured Lawyer of the Russian Federation, Chief Researcher of the Institute of State and Law of the Russian Academy of Sciences; Ivan V. Kholikov – Doctor of Law, Professor, Professor of the Institute of Legislation and Comparative Law under the Government of the Russian Federation. Abstract. 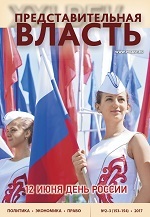 The article deals with the requirements and opportunities of legal regulation of the process of determination of fitness for flight work on health condition grounds of flight personnel of Civil and State Aviation of the Russian Federation. The current characteristics of medical-flight expertise in civil and state aviation, its’ close link to flight safety are revealed. The authorities of federal bodies of state power of the Russian Federation as well as reasons and conditions that contributed to insufficient regulation of medical-flight expertise in our country are studied. The key problems of threats to flight safety, stipulated by human factor, are demonstrated; the possible ways to improve the legal regulations of this activity are identified. Key words. Сivil aviation, flight safety, flight work, state aviation, health condition, medical-flight expertise, military-medical commission, medical examination. Yakubenko Konstantin Y. - head. 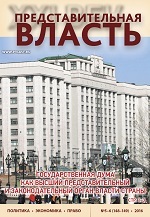 Department of theory and history of state and law of the East Siberian branch OF the RUSSIAN state University of justice, PhD, associate Professor. Abstract. In this article, we give a brief analysis of current trends in the legal conscience of subjects of law-making in Russia. At the moment, the importance and role of lawmaking is of great importance for the planned and predictable development of the state. The past 24 years of the operation of the Russian Constitution have shown difficulties in the implementation of law-making and the problems in the traditional sense of justice of subjects that contradict the high principles of a legal and democratic state. 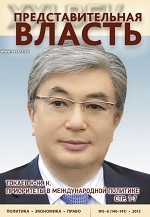 The author gives sociological data on the activities of the legislator of the country, which testify to the lack of a thought-out strategy for the country's legal development without reliance on scientific doctrine and the concept of law-making public policy. This situation seems to us unacceptable, because from the existing representations of subjects of law-making the quality of social life depends. Legislative activity is a way of managing public processes and the affairs of the state. The author tried to give his modest assessment of the legal consciousness of subjects of lawmaking and trends in this area and raise the issue of the need to improve the procedures for law-making and the development of the concept of law-making policy of the state on the basis of modern ideas about law. 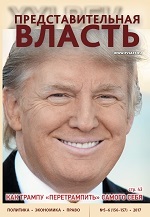 Key words: sense of justice, lawmaking, lawmaking, current legislation, legal policy, "law of laws", the Constitution of Russia. Balyhin Artem G. - Lecturer, Department of constitutional and municipal law of FSBEI HPE "Moscow state juridical University named after O.E .Kutafin (MSAL)". Abstract. The article is devoted to the main issues of the organization of the activities of local governments, urban districts and municipal districts. The estimation of efficiency of activity of these bodies is considered. Analyzed management policies to the transparency of bodies to the population, with the aim to monitor and evaluate the effectiveness of the work. Key-words. State and law, local self-government bodies, municipal districts, administration, budget, state and municipal bodies. Nikolai Arefiev. First Deputy Chairman of the Committee on economic policy, entrepreneurs hip and innovation, the State Duma of the Federal Assembly of the Russian Federation; Eugeni Mozhaev - doctor of economic Sciences, Professor, acting rector, Russian state agrarian correspondence University. Abstract. The article considers the issues of technical and economic possibilities of using different types of alternative energy, prospects of fusion energy, changes in global economic strategies related to the promotion of alternative energy. Key words. Alternative energy, physics, fusion energy, economy. Amiantov Alexey A. – the office of the State Duma of the Federal Assembly of the Russian Federation, chief specialist; Peoples' Friendship University of Russia, associate Professor, candidate of political Sciences; Maslianyi Aleksei A. – the Notary of the city of Moscow, a lawyer. Abstract. 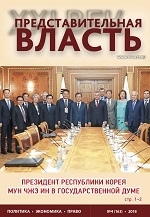 The article discusses the legal basis of the organization and activities of the legislative bodies of state power of the Russian Federation, as well as the powers of regional parliaments. The peculiarities of interaction of regional parliaments with the President of the Russian Federation and the leadership of the Russian region are revealed. Key words: State and Law, legislative body, subject of the Russian Federation, powers of regional parliaments, Regulations. Yashkova T. - Doctor of political Sciences, Professor of the Department of philosophy and political science the Atis; Pletneva M. – applicant, of the Russian Presidential Academy of National Economy and Public Administration (RANEPA). Abstract. This article is devoted to elections as an important component of politics and their effectiveness. Such elements of efficiency as private property, the presence of the middle class, the existence of the developed civil society in the country are considered. The authors analyze, from the point of view of the effectiveness of the innovation of the territorial election commission, in particular the abolition of absentee lists and the opportunity for the public chamber to nominate its observers for the elections. 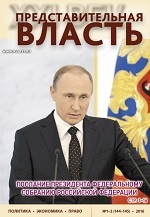 The article sums up the results of the elections and concludes the mood of the Russians. Key words: Absenteeism, elections, civil society, voting candidate, observers, election results, election integrity, civic chamber, CEC, efficiency. 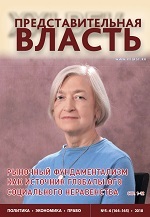 Alexandrova N.A., Ural State University of Railway Transport, Head of the Department of personnel management and sociology, associate Professor, Candidate of Philosophy, Ekaterinburg, Russia; Simahkova N.N., Ural State Agrarian University, Associate Professor of the Management and law, Candidate of Нistorical sciences, Ekaterinburg, Russia. Abstract. The article examines the problems of the effectiveness of state activity in the social sphere, through the prism of the evaluation of the scientific discourse on issues of social management and its systems. Improving the efficiency of reproduction of social capital and the quality of life as a reflection of the effectiveness of social management. The effectiveness of social management is examined not by assessing the overall results of the functioning of the social system, but on those that are the direct consequence of managerial decisions, the result of implementing the social policy of the state. Key words: social management, efficiency, quality of life, social sphere. Salimov Dilovar M. - Northern (Arctic) Federal University named after M.V. 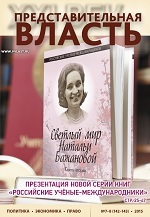 Lomonosov, Russian Federation, Arkhangelsk, Severnaya Dvina amb.1, graduate of the Department of regional studies and international relations of Higher school of socially-humanitarian sciences and international communication. Abstract. The article discusses the main trends of media participation in the political process of modern Tajikistan, as well as their role in shaping public opinion. On the example of state, independent and party mass media the author shows the state of mass media in the period of independence of the country. The development of the country's political system on the basis of democratic principles contributed to the emergence of new media, which positioned themselves as a political institution. Key words: information policy, freedom of speech, power, mass media, state, political journalism, public opinion.